At Advanced Animal Care, we pride ourselves with always searching for new ways to care for your dog especially where pain is concerned. Veterinary laser therapy provides a non-invasive, pain-free, surgery-free and drug-free treatment that is used to treat a variety of conditions, and can be performed in conjunction with existing treatments. Laser treatment for dogs employs deep-penetrating light to promote a chain of chemical reactions known as photobiostimulation. This process helps relieve pain through the release of endorphins, and it stimulates injured cells to heal at an accelerated pace. Postoperative laser therapy will decrease inflammation after surgery, help them heal a little bit faster, speed up recovery time, and make them comfortable a lot faster. Laser therapy can be used for several different things, one being to help decrease pain. We have several dogs that have back problems, such as disc disease and arthritis, and it helps to decrease the pain. It also helps to decrease inflammation. We are offering postoperative laser therapy now to decrease inflammation after surgery, help them heal a little bit faster, speed up recovery time, and make them comfortable a lot faster. Laser therapy also helps with ear infections and with swelling in the ears. So, there are several different uses. We are continuing to research and find more and more ways that lasers can be used to help out dogs. Laser therapy is not painful. It does get a little bit warm, but we do have certain settings that we use to make sure that we're holding it in one spot for a certain amount of time to where it's not hurting the animal, but it does just get a little bit of a warm sensation to it. As far as acute pain goes, for more of the short-term kind of pain, it does help in decreasing swelling and inflammation, so it is especially helpful for those dogs that have sudden back problems. With arthritis, the joint develops inflammation over time, so laser therapy is performed pretty often. We even have some patients that come in once a week or so to get laser therapy done. It helps to decrease that swelling and inflammation within those joints. During laser therapy, our patients do wear Doggles, so that their eyes are being protected from the laser beams. Same thing for us, we wear goggles as well so that the laser is not directly shining into any eyes. We also focus on not holding the laser in one spot for too long so that it's not getting too hot for them and making them uncomfortable. There really aren't very many risks to laser therapy. Your dog could feel a little bit warm on the site being treated. That's usually pretty temporary. But generally, there aren't really any other side effects. We've only seen benefits so far. It is a good idea for us to do an exam prior to doing laser therapy. That way, we can get to know your dog and your schedule to see if laser therapy is something that can even be accommodated. 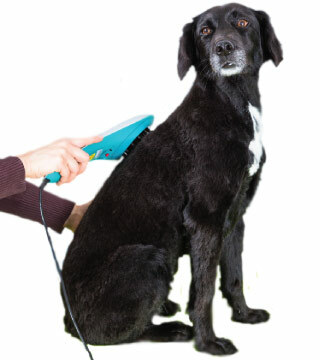 It does actually take several visits for us to do laser therapy and have it be effective. Particularly if we haven't seen your dog before, an exam can help us determine if laser therapy is actually going to be beneficial and develop a plan for treatment. As far as results, it really does vary. If we have a wound that we're trying to allow to heal, it can take a few weeks for it to completely resolve. But with inflammation due to arthritis or joint pain in general, we do see some improvement after about three to four cycles of laser therapy.